When one comes to Ljubljana, it is easy to fall in love with this Eastern European city. However proximity to Western Europe, membership in the Eurozone and relatively small population of 2 million people all speak against of Slovenia as a potential location of a software development outsourcing center. Yet the facts prove otherwise. Slovenia’s capital and the largest city, Ljubljana, is a vibrant and diverse economical, political and administrative centre. 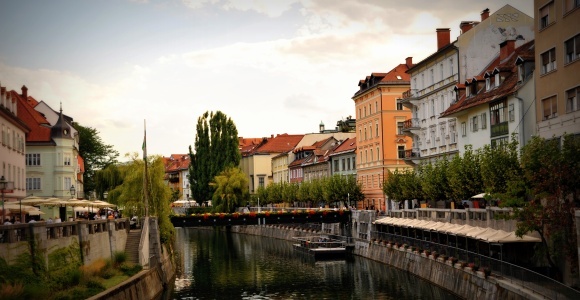 Whilst it can easily win a contest for the most beautiful city in Central and Eastern Europe, Ljubljana is particularly attractive because of its key geographic location, which makes connections and the establishment of outsourcing center easy and manageable. Ljubljana’s only university, the University of Ljubljana, educates 64,000 students, making up 1/7 of Ljubljana’s population. The university offers specialized courses in Computer and Information Science, as well as in Electrical Engineering. Many of the university’s graduates go on to pursue a career in Ljubljana’s IT and ICT sector. According to Domen Garbajs, a labor market expert from Slovenia’s leading IT recruitment firm Adecco, the average salary of a .Net developer with 3 years experience is 1,300 EUR net per month. The annual gross income of a .Net developer is roughly 25,000 EUR (2083 Euros per month). The average salary of developers in Android, an IT area which has seen significant development over the last two years, is also 1,300 EUR net monthly. Garbajs also indicates that the main recruiters of IT talent in Slovenia are outsourcing companies. A downside of this thriving market can be seen to be Slovenia’s rather high tax payroll rate of 41%. An example of a successful outsourcing company operating in Slovenia is Comtrade. Comtrade is Slovenia’s largest company, specializing in development and implementation of a wide range of ICT solutions. The company’s operations span from independently developed applications to the customization of mainstream products. Comtrade began offering international outsourcing services in 1999, and subsequently expanded significantly throughout South East Europe. Currently, it has 16 companies in 12 countries across North America and Europe. Ljubljana is also a popular outsourcing destination because of its excellent transportation links. The capital is located in the heart of Slovenia and linked to major European cities through an extensive road network. It provides excellent connections with Italy, Croatia, Austria and Hungary. Vienna is only three-hour drive away. Ljubljana Airport operates flights to numerous destinations, such as Amsterdam, Athens, Barcelona, Copenhagen, Dublin, London, Moscow, Munich and Paris, making it easier for businesses to communicate and operate globally. And last but not least, a few words about startup community in Slovenia. Our earlier coverage of Credo Week in Ljubljana shed some light on the emerging Internet companies. The most known ones are perhaps Zemanta (Seedcamp company 2007), Outfit 7 (the makers of “Talking Tom”, and whose founder Andrej Nabergoj is working on a new venture Iddiction), Vox.io which contests Skype with a new generation telephony service, Celtra, the rich media mobile advertisement company and DoubleRecall, the Y-Combinator company which makes online advertisements more effective. The founders of these companies have alas left Ljubljana for the US, which remains still a prime destination for tech entrepreneurs. Most of them, however, keep software development operations in Ljubljana. Contact us if you need help with outsourcing or opening your R&D unit in Slovenia or one of the other CEE countries.